Using a deep pot saute ginger, onion and garlic till caramelized in medium low heat. Add potatoes and saute till potatoes are half way cooked. 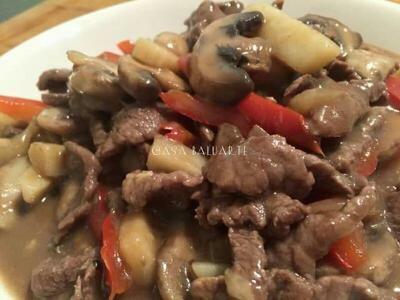 Add slices of beef and season with ground peppers and soy sauce. Add water and simmer for 5 minutes or till beef is fully cooked, cover pot. 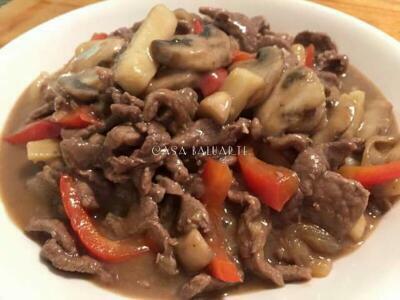 Add fresh mushroom, bell peppers and cream of mushroom. Simmer for few more minutes or till vegetables are fully cooked. Remove the dish from the heat and serve.